Our 4th annual celebration of labor films across the globe was a smashing success. 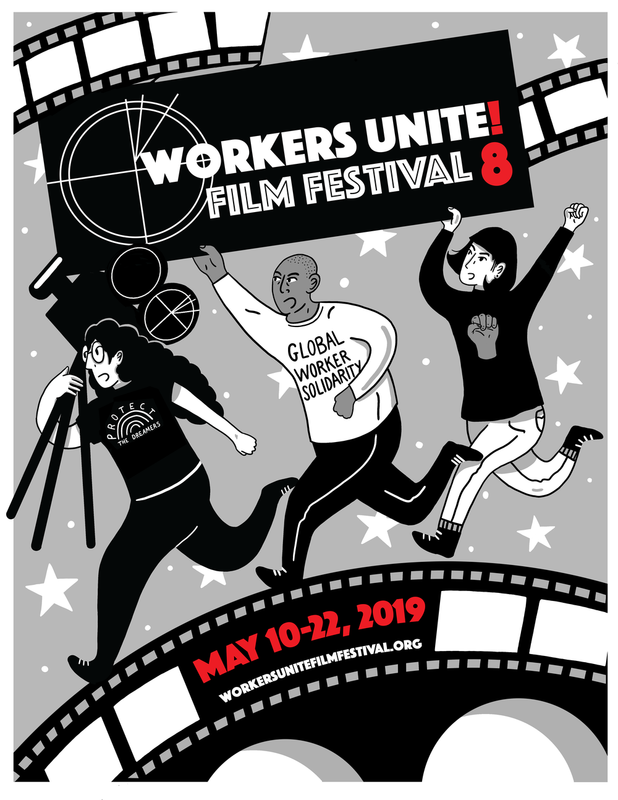 In May, the Workers Unite Film Festival (WUFF) hosted over 50 documentary and short screenings along with discussions in a variety of locations. WUFF also debuted an Activist Filmmakers Bootcamp program, led by Docs in Progress, which is sure to become a mainstay of the festival. This year WUFF also livened things up with thematic poetry riffs, freestyle hip-hop, mixed media performance, and even a live jazz band. After much deliberation among the judges, we have finalized the list of Best of Festival winners for the 2015 film festival. A highlight of some of the honorees is below with the full list at the bottom of this article. Stay tuned for details about a special Awards Ceremony which we will host in the Fall. The winner of Best Documentary Feature for 2015 is "Blood on the Mountain." This film is a captivating historical perspective on the coal mining industry set in West Virginia, where political corruption, safety/environmental violations, and lack of corporate responsibility reign supreme. The climate around coal mining in West Virginia allows industrialists to literally re-write history while demoralizing workers. Then, with an Honorable Mention for Best Documentary Short is "Mill Stories." The film takes a more sentimental view, illustrating the tight camaraderie that often develops between generations of steel mill workers in order to express their pride, take care of one another, and survive harsh conditions. Next in film festival honorees, “A Day's Work" and “Poverty, Inc.” ended up tied for Audience Favorite. “A Day’s Work” is a film that focuses on the unsafe working environment temp workers face. The film follows the case of a young man killed by a machine on his first day at a new job. It highlights the lack of safety training for all temporary employees and how the growth of that industry is seeking to eradicate worker rights. "Poverty, Inc.," looks at the imbalanced relationship between workers and big business while showing how it's creating a cascade of systemic poverty on a global scale. From Australia to Central America, these next two films highlight people fighting back for justice: "Power State," earned an Honorable Mention as a Narrative Short and is a narrative piece which shows a union leader in the electrical trade resisting bribes and intimidation by corrupt police. Then, "Resistencia," earned an Honorable Mention as a Documentary Feature for being a truly grassroots level film about the workers of the palm oil plantation fields in Honduras. It follows the workers as they move to reclaim their right to the land, quality of life, and basic protections on the job from a handful of land-owning overlords who will stop at nothing short of murder, arrest, or destruction of homes for those occupying the land in protest. A rich history of labor actions and cultural shifts are explored in "She's Beautiful When She's Angry," which earned Honorable mention for Documentary Feature. The film is a touching, amusing, and very thorough film chronicling the women's liberation movement in the U.S. from the mid-1960's to the present day where work and pay limitations remain an issue. Putting a decidedly innovative spin on laundry, we have "Every Fold Matters" which won Best Narrative Film, a rhythmic performance film centered on the daily lives of laundromat workers who show how routine actions, objects, and gestures that can develop their own private meanings. Rounding out the films on domestic work is "Sunset Cruise" which won Best Documentary Short. This film is about Jamaican home aid workers caring for the elderly, a sometimes somber proposition. Our final narrative, "Somos Amigos" won Best Narrative Short and asks the question: What would you do if you had to fire your best friend? A full listing of films and programs can be found in the WUFF 2015 Program Guide (PDF).